Make the most of Christmas dinner leftovers with a turkey, stuffing and cranberry pie made with hot water crust pastry. Sift the plain and strong flour and salt into a mixing bowl. Using your fingertips, rub the butter into the flour until the mixture resembles breadcrumbs. Make a well in the centre of the mixture. Heat the lard and 200ml/7fl oz water in a small saucepan over a medium heat. When the mixture is simmering pour it into the well in the flour mixture and stir with a wooden spoon, gradually drawing the dry mixture into the liquid, until the mixture comes together as a dough. Grease a 18cm/7in springform cake tin, or raised pie mould with melted lard. Make sure you grease the tin liberally to prevent the pastry from sticking. Tip the dough onto a lightly floured work surface and knead until smooth and pliable. Roll out three-quarters of the dough and use it to a line the prepared tin. Press the pastry into the base and sides of the tin to prevent air bubbles from forming. Leave the excess pastry hanging over the edge of the tin. For the filling, spoon half of the stuffing into the pastry case and press down with the back of a spoon. Arrange half of the turkey over the stuffing, then season with salt and pepper. Mix the cranberries and cranberry sauce together and spoon half over the turkey. Repeat the layers once more, pressing down as before. Roll out the remaining pastry until it is large enough to cover the pie. Brush the overhanging edges with water and place the lid on top, squeezing it together at the edges to seal. 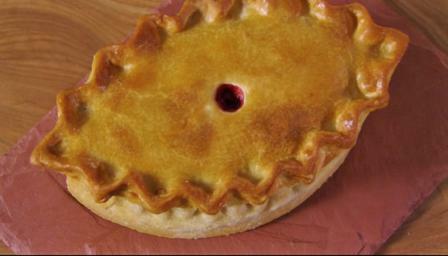 Trim off most of the excess pastry using scissors or a knife, and crimp to create a decorative edge. Make a small hole in the centre of the lid and chill for 30 minutes. Preheat the oven to 180C/350F/Gas 4 (fan 160C). Place the chilled pie in a roasting tin (to catch any juices that may leak from the pie tin) and cook for 45 minutes. Remove from the oven and brush with beaten egg to glaze. Return to the oven for 15 minutes. When the pie is cooked, remove from the oven and leave to cool on a wire rack for 10 minutes. Leave to cool for a further 30 minutes before removing from the springform tin or pie mould.